Greenhouse Gab | Let’s get growing! The greenhouse glazing is the material that the greenhouse walls are made of. You can help minimize heat loss by selecting the best glazing possible. Fivewall polycarbonate is 16mm thick and is the best glazing material on today’s market. The next best is double tempered glass, followed by twinwall polycarbonate, and lastly, single tempered glass. 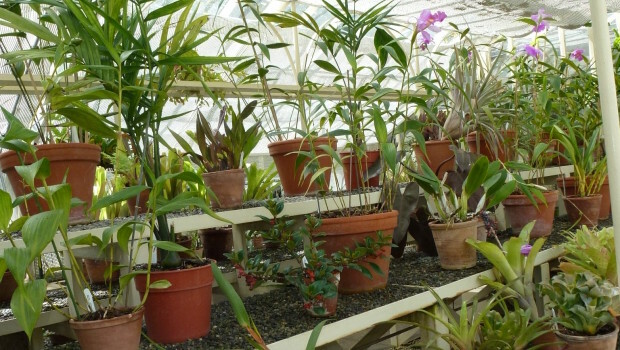 Depending on your climate, most of us have to add some form of supplemental heat into the greenhouse to sustain temperatures of at least 45 degrees F. Depending on the plants or flowers in your greenhouse, you may require warmer temperatures. Most plants grow best at temperatures between 45 degrees F and 75 degrees F (or 10 – 24 degrees C). You may want to consider having your north wall, a solid wall. If you cannot build a solid wall, then it is best to insulate this wall as much as possible. The reason why the north wall is best for this, is because this side of the greenhouse receives the lowest amount of sunlight (unless you live south of the equator). Consider wrapping a 3mm thick plastic (found in big box hardware stores) on the inside of the greenhouse to create an additional barrier. Be sure to seal any cracks. Shelley Awad Greenhouse Consultant, Shelley Awad, provides everything you need to know about greenhouses. Whether you are buying a greenhouse or you already own one, you’ll learn tips and tricks on greenhouses and how to grow year-round. Questions always welcome. Shelley Awad on What’s a Door Drop? Greenhouse Consultant, Shelley Awad, provides everything you need to know about greenhouses. Whether you are buying a greenhouse or you already own one, you’ll learn tips and tricks on greenhouses and how to grow year-round. Questions always welcome.